The Governor mentioned in the opening speech that The Central Bank of Libya in partnership with the Presidential Council has provided a number of reforms and policies that will ensure processing the structural distortions in the Libyan economy. Mr.Saddek Omar Elkaber, The Governor , has mentioned the obvious increase of the Revenues of the country during year 2017 which exceeded 13 Billion Dollars noting that The Central Bank relies on the members of the teaching staff of Libyan Universities , The Youth and all categories of Libya to participate in succeeding the economic reform program to save the economy and reform the financial crisis that the country faced the last period , stressing that The Central Bank of Libya will continue in the economical reforms , which has became an urgent necessity for everyone, first and for most ending the political division of the state which resulted lack in security and other negative results, hoping that year 2018 will be an effective launch for the economic and financial reform program that will provide a remarkable improvement for the country. 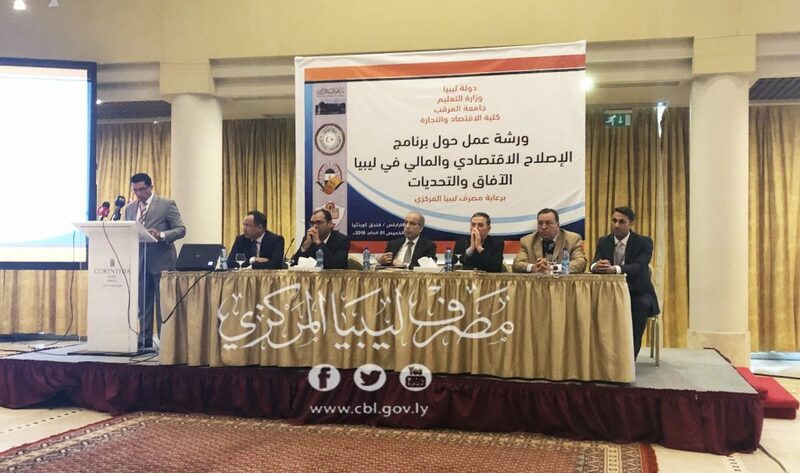 The workshop included three scientific sessions , where several papers were presented and it’s expected that important recommendations will be made to the concerned parties to implement the economic and financial reform program.